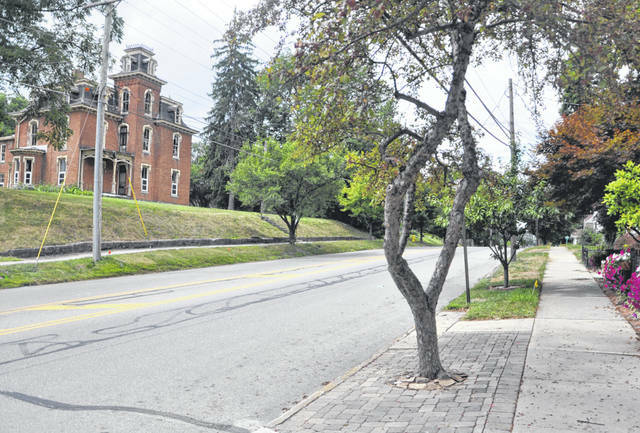 Developer Jim Manos is seeking approval from the city to renovate the historic Perkins House, left, and build an additional structure behind the home to create a 43-room hotel adjacent to the Ohio Wesleyan University campus. Residents on West William Street, however, are concerned about the possibility of losing their on-street parking spaces on the north side of the street, pictured to the right, in order to create a left-turn lane into the proposed hotel. Plans for a 43-room hotel to be constructed as an addition to the Hiram Perkins House at 235 W. William St. remain in a holding pattern as the developer and City of Delaware officials continue to work on alleviating concerns from residents who live across from the historic home. The Delaware Planning Commission unanimously approved the proposal of the “Wesleyan Inn” at its June meeting. Residents who live in the adjacent houses to the Perkins House have continued to show up and voice their displeasure with the entire proposal, essentially rebuking the notion that a hotel, especially in that neighborhood, would be a benefit in any way to the city. “We know what happens at hotels. Shootings come out of hotels, people are found dead in hotels … you can’t dictate who stays in the hotel,” one resident stated at the planning commission meeting. In addition to their overall narrative that a hotel could be a breeding ground for shady dealings and unwanted noise and light pollution, concerns surrounding what to do with the on-street parking spaces located on the north side of West William Street, opposite of the Perkins House, as well as additional traffic, have remained the primary points of contention. With a left-turn-only lane proposed heading west on William Street, a “bump” curb has been discussed that would allow for the additional lane while also not eliminating the parking spaces. The majority of the houses along the north side of the street include little to no driveways, making the parking spaces vital for residents. In addition to the lack of driveway availability, those houses have little to no front yards between their front doors and the sidewalk and street. Curb cuts would only decrease that space, residents have noted. At the July 9 meeting of City Council, developer Jim Manos had stated he would be fine with moving the street parking to the south side of William Street. With Councilwoman Lisa Keller, who oversees the ward in which the Perkins home sits, not present at the July 9 meeting, she requested no action be taken on the proposed development until the next council meeting. However, at Monday’s meeting, members of the development team stated they are still looking for ways to preserve the current parking on the north side of the street, as well as discussing the realignment of the access point and entrance to the hotel. They added the plan is to amend the exhibit and resubmit the proposal to the city ahead of the next council meeting, which will be held on Aug. 13.
https://www.delgazette.com/wp-content/uploads/sites/40/2018/07/web1_Perkins.jpgDeveloper Jim Manos is seeking approval from the city to renovate the historic Perkins House, left, and build an additional structure behind the home to create a 43-room hotel adjacent to the Ohio Wesleyan University campus. Residents on West William Street, however, are concerned about the possibility of losing their on-street parking spaces on the north side of the street, pictured to the right, in order to create a left-turn lane into the proposed hotel.